Unless other wise specified please NOTE: Minimum 72-hours advance notice required to avoid cancellation charges. "Shout out to Coach Gabriel! My daughter, Danielle, played soccer for 8 years but wanted to learn how to play tennis so that she could be a part of the Yucaipa High School tennis team. I hired a professional coach and she began taking private lessons with Coach Gabriel in March 2017, just once a week. Coach Gabe taught Danielle the basic strokes and quickly had her competing against other players. She enjoyed playing and each week Coach taught her something new. Danielle also learned how to serve efficiently and practiced all summer. The second week of school, August 2017, she tried out for the YHS championship girl’s tennis team. Because of the lessons she took with Coach Gabriel and practicing all summer, she made the team! This year Danielle will earn a letter for her Letterman's jacket. I can't say enough great things about Coach Gabriel! Thank you for all the hard work! You’re the greatest!" He is a very engaging coach. I have learned so many new things, and I wouldn't be where I am now without Coach Gabriel. "Coach Gabe is very patient and professional. He answers the kids questions and uses multiple instructional techniques for each child to help them improve. Through tennis drills he corrects the student's mistakes early on, so they don't pick up bad habits." "I have developed as a player." I have known and taken private tennis lessons from Coach Jacob for ten years and throughout those years I have learned a tremendous amount about the sport of tennis. As I have developed as a player, Coach Jacob has always pushed me and supported me to become the best tennis player I can be. Also, he is always learning the newest and the best tennis techniques and theories that allowed me to expand my tennis game. Now I help out during the summer camp where I witness the enthusiasm and expertise that Coach Jacob has for the kids. Every time I have a lesson with or talk with Coach Jacob, I realize the knowledge and love that he has for tennis. "Climb the ladder of success." "Coach Gabe is an awesome tennis coach. Rather than a one size fits all approach to teaching tennis, Gabe tailors his lessons to fit each student. He teaches basic stroke production, proper and efficient movement, as well as strategy, tactics, point construction and the mental toughness aspect of tennis. With Gabe on your side, your game will definitely improve and 'climb the ladder' of success." 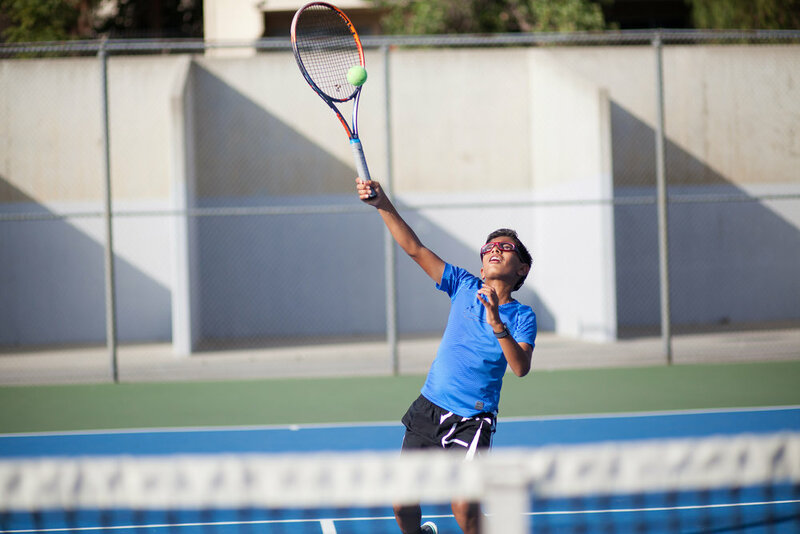 "The private tennis lessons that Coach Gabe provides not only helped our kid in the fundamentals of the game, but also has improved his confidence on the court. From stroke, to serve, to footwork, Coach Gabe is able to intelligibly breakdown the bio-mechanics of each aspect of the game in order to quickly identify deficiencies, and address them with the countless drills he has in his tool belt to help our kid become a more well-rounded tennis player. Thanks Gabe." Coach Gabriel Jacob and his tennis programs have tremendously improved my daughter’s tennis game! Seeing her play now, as opposed to just one year ago, is like watching a different person altogether. His programs trained every aspect of her game: physical and emotional, especially mental toughness and attitude (being proactive). Not only that, but Coach Gabriel has helped make tennis fun and enjoyable for her, and she loves tennis so much now. I’m a sophomore at Aquinas High School in San Bernardino. I met Coach Gabriel this summer and was given the opportunity to take tennis lessons from him. My skill and game improved since last spring and I attribute this progression to all that Coach Gabe has taught me. I hope to continue working with him and learn tennis better. I respect Coach Gabriel for his knowledge, skill, and positivity. I’m proud to be his student. “I have had a lot of so called 'tennis teachers' in my background but none who was as kind and generous in dealing with my attributes and my failings. Gabriel knows how to get the best out of me and yet respect my limitations. I have learned so much and now feel so much more confident in my game! I would highly recommend him to anyone who wants to 'raise the bar' yet not get hit with it! You can't go wrong investing your time with Gabriel." "Paved the way for my collegiate career." After working with Gabriel for only a few group lessons, he pulled my parents and myself aside and said he wanted to start working with me one on one as he saw real potential. Within a few months I had won my first USTA junior tournament, and was obsessed with the sport. After working with him for 3 years, I started as the # 1 varsity player for Citrus Valley high school for all 4 years. With Gabe’s help I managed to come to a 116-4 career high school record, and that includes finishing my last 3 years at a 90-0 undefeated mark. It definitely paved the way for my collegiate career. I’m now entering my senior season playing for Monmouth College at the # 1 singles and # 1 double slots. I can say with 100% certainty Gabriel is the reason my game has developed the way it has, and the reason I have the passion for the game that I do. I still work with Gabe whenever I am at home, and am honored to coach along side him and to be involved with helping in his organization. There is no one more knowledgeable and passionate about this amazing sport than Gabe.